Noni fruit is small and bitter tasting. Noni fruit leather is a product that can be eaten or used topically to treat a wide variety of ailments and conditions. The leather is made from a tropical fruit that comes from the noni tree. 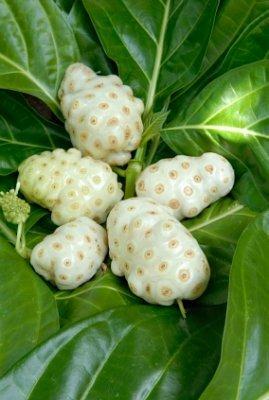 The noni tree goes by the Latin name Morinda citrifolia, and the fruit is also called cheese fruit, nono, Indian mulberry, and Tahitian noni. Polynesians have been using all parts of the tree, including the fruit, bark, roots, leaves, and seeds, for centuries. Noni fruit and seeds are loaded with nutrition, and they also contain antibiotic and healing properties for both internal and external uses. Noni fruit can grow up to 6 inches in length, and the outer skin is pale and bumpy, loosely resembling that of a pineapple. The taste of the fruit is very bitter, and often requires the addition of sweeteners and other fruits to appeal to Western tastes. The smell of the fruit is also quite pungent, requiring the use of scented oils when creating lotions for consumer use. Noni fruit leather is a fascinating product. It is created from dried noni fruit, which can be fermented or combined with other fruit to make a dark and soft fruit leather. Most of the leather sold in North America comes from Hawaii, and the product is sold by the ounce. Since most noni leather is made from 100% organic fruit, it is perfectly safe for vegetarian and vegan diets. Sellers of noni fruit leather have called the product a portable first aid kit, and it's easy to see why. The leather is easily portable, and can be used for many different ailments and conditions, both internal and external. It doesn't need to be refrigerated, and it's entirely biodegradable. Soften the fruit leather in hot water, and then combine it with traditional smoothie ingredients to mask the taste. Add a small amount of the leather to flavored tea, and add a sweetener if needed. Make a paste from the noni leather and combine it with peanut butter, hummus, or other flavorful spreads. To find more information about noni fruit leather and the benefits of the noni fruit, you can visit Phytochemicals.info, or NoniFruitLeather.net.